Why Is Drinking Salt Water Not Healthy for You? What Is Potassium Used for in the Body? The pineapple is a sweet tropical fruit native to South America. Today, the pineapple is also cultivated in Asia and Hawaii. The Hawaiians established the first substantial pineapple plantation in the 19th century, but shifted pineapple processing to the Philippines, where Dole produces much of the world's pineapple juice today, to reduce labor costs. Pineapple juice provides a variety of nutritional benefits. 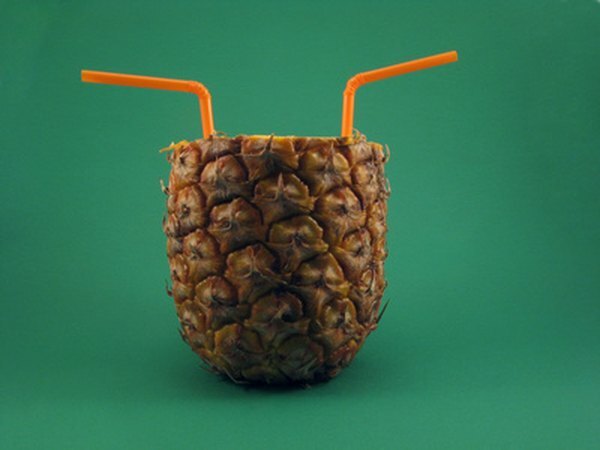 An 8-ounce glass of pineapple juice contains 132 calories, or 7 percent of a standard 2,000-calorie diet. Pineapple juice is a sweet, refreshing beverage with far fewer calories than fattening foods. An 8-ounce serving of pineapple juice contains only 0.3 grams fat. The vitamin C content in 8 ounces of pineapple juice is 25 milligrams, or 42 percent of the 60 milligrams recommended daily intake. Vitamin C supports the immune system and prevents the development of illnesses and infections by stimulating the production and function of white blood cells. It also protects cells from oxidative damage that free radicals, toxic by-products of metabolism, can cause, according to a 2002 University of Colorado at Boulder study. An 8-ounce serving of pineapple juice provides 325 milligrams of potassium, or 9 percent of the 3,500 milligrams daily value. The body needs potassium to contract muscles, including the heart muscle and the intestinal muscles that stimulate waste elimination. These functions promote cardiovascular and digestive health. The potassium content is high in most fruits and vegetables. A diet that includes a high level of sodium increases the body's need for potassium because the minerals must exist in a balanced ratio. The intake of sodium is typically three times higher than the intake of potassium in the typical American diet, according to the Linus Pauling Institute. The water content in 8 ounces of pineapple juice is 86 percent. The consumption of an adequate fluid level is important for flushing toxins from the body through the urinary tract and providing the necessary fluid to regulate blood pressure. Warm weather and physical exercise increase the body's water requirements. Including pineapple juice in the diet can help prevent dehydration. MayoClinic.com: What Does Percent Daily Value Mean on Food Labels?